During “Refugee Week” 2017 (19th-25th June), Amnesty Kirklees set up a stall in the beautiful Greenhead Park in Huddersfield. We were visited by many, many people who, like us, sympathised with refugees globally, and recognised the severity of their plights. In September 2017, Amnesty Kirklees filled the pews of Huddersfield Parish Church with photographs and information relating to almost 300 Turkish journalists. These men and women, some of whom couldn’t even be contacted to provide their photos, have been persecuted in a clampdown by the Turkish state following the attempted coup in 2016. Our exhibition attempts to convey the impact of all these journalists being removed from society, and stopping their role of telling truth to power and the people they are meant to serve. Many people came into the church to see the photographs and to help the cause by writing a short message of support to a detained journalist on one of our post cards, for us to then send on their behalf. The exhibition was very well received by the people of Huddersfield, and many felt quite moved by the poignant spectacle. We were even visited by 2 journalists who actually featured in our exhibition! They too were moved and taken aback by not only the visual representation of so many of their colleagues, but also the powerful gesture of solidarity by our local Amnesty members, and all the visitors from Huddersfield town centre. 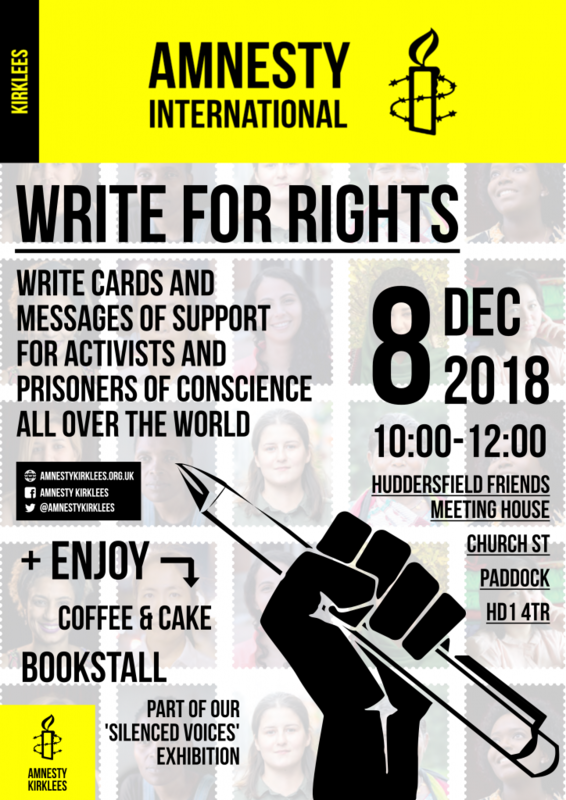 Amnesty Kirklees’ “Silenced Voices” exhibition is available for other local Amnesty groups and human rights organisations to hire. Please get in touch for more info or to enquire about availability. Sometimes a letter can change someone’s life. That’s the premise of Write for Rights, Amnesty’s global letter-writing campaign. Today, it’s one of the world’s biggest human rights events. Right-click on the image and choose ‘save…’ to share with friends!